Bruce had arrived in Paris in 1904 and painted this canvas there in 1911, at the height of his absorption in the works of Henri Matisse and Paul Cézanne. He was an original member of the Académie Matisse, the private art school where the French master instructed young artists from 1907 to 1911. By mid-1907 Bruce’s work began undergoing radical changes as he adopted the intense Fauvist color palette Matisse had popularized. 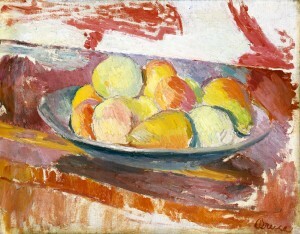 It was also Matisse who introduced him to the work of Cézanne, which became another major influence. The composition of this still life is clearly indebted to similar works by Cézanne from the 1890s. Bruce continued to be influenced by contemporary French art movements throughout his career, including Orphism (an offshoot of Cubism that focused on pure abstraction and bright colors) and Synchromism (an abstract movement that connected color to music). His mature works featuring hard-edged geometric forms in flat, evenly applied colors anticipate the Purism developed by Fernand Léger and Amédée Ozenfant in the 1920s. Milton Brown, The Story of the Armory Show, rev. ed. (New York: Abbeville Press, 1988), 70. See M. Bernard Dorival, “L’Affaire Delaunay à l’Armory Show d’Apres des Documents Inédits,” Bulletin de la Société de L’Histoire de L’Art Français (May 1927), 324-327. “French Artist at Odds with N.Y. Exhibitors,” New-York Tribune, March 2, 1913, 4. Patrick Henry Bruce arrived in New York from his native Virginia in 1902 to study with William Merritt Chase at the New York School of Art. By 1903 he was studying with Robert Henri, who encouraged Bruce to approach art through intense observation and personal experience of the world around him. Henri also persuaded him to paint in a loose style reminiscent of Diego Velázquez, Edouard Manet, and James McNeill Whistler, which resulted in the expressive brushwork and bold color that characterize his early works. By late 1903 or early 1904 Bruce was in Paris, where he continued to paint in a style inspired by Henri for at least two years. He became immersed in French modernism around 1906 when he met the Steins—Gertrude, Leo, Sarah, and Michael—and became a frequent visitor at their salons. It was through the Steins that he met Henri Matisse, who became a close friend and who exerted a significant influence on his painting. Bruce was an original member of the Académie Matisse, the private art school where the French master instructed young artists from 1907 to 1911. Contemporary French art movements inspired Bruce throughout his career, and his canvases show the influence of styles including Orphism (an offshoot of Cubism that focused on pure abstraction and bright colors) and Synchromism (an abstract movement that connected color to music). His mature works featuring hard-edged geometric forms in flat, evenly applied colors anticipate the Purism developed by Fernand Léger and Amédée Ozenfant in the 1920s. See William C. Agee, Patrick Henry Bruce, American Modernist: A Catalogue Raisonné (New York: Museum of Modern Art, 1979); and Patrick Henry Bruce (1881-1936): Paintings, exh. cat. (New York: Salander O’Reilly Gallery, 2002).